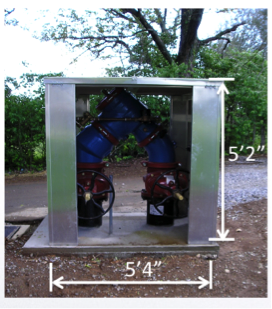 The most common objection we hear about the use of above ground enclosures for backflow preventers is the aesthetics. We get it. No one wants another big, shiny box distracting customers from the appearance of a new building. But the best location for the backflow device is above ground in an ASSE 1060 enclosure. Backflow devices should not be installed in a vault for risk of a cross connection when the vault floods and RPZs shouldn't be installed inside the building where they could potentially cause significant flooding. So what do you do? Let's look a a few considerations including colors, landscaping, location, and sizing. This may seem obvious. But few designers realize enclosures are available in many colors. 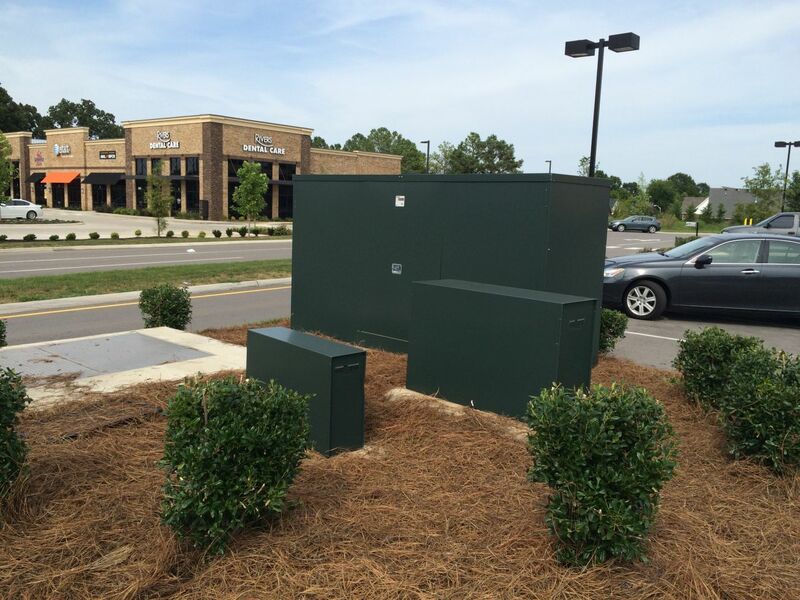 On many commercial projects, we've noticed the electrical transformer is green and it looks much more aesthetically pleasing. Notice the green enclosures in the picture below. They are a much better option than the shiny aluminum. The architect and building owner will be more in favor of this look. As far as we know, all manufacturers charge more for a color – other than silver – except Safe-T-Cover. We offer three different colors at no extra charge for standard enclosures. The three colors are: Hartford Green, Sierra Tan, and Slate Grey. For an additional charge, we have a wide variety of other colors available. Here is a link to the full list of color options available. Many people ask us how the color is applied and are pleasantly surprised. They are not painted and there is no risk of chipping over the life of the enclosure. We work with Pac-Clad®, the largest manufacturer of metal roofs in the United States. They apply a prefinished sheet metal coating of 70% full polyvinylidene flouride to the aluminum. It was originally developed for use in abrasive environments but is also ideally suited for enclosures. For a custom enclosure, adding color typically adds 15-20% to the price. One of the easiest ways to make an enclosure more attractive is to design landscaping around it that hides it. This can be done before installation or even after, making it the easiest way to diminish an enclosure after it's already in place. We notice on most new construction projects that the landscaping for the enclosure was not thought about in the landscaping package. 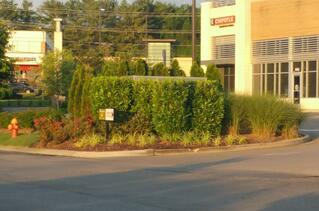 The building, parking lots, dumpsters and main entrance all seem to have well thought out landscaping design. But then there sits the enclosure with little if any landscaping. Below you can see a few projects where the enclosures were thought about in the landscaping package and are nicely disguised. So the next time the architect or building owner complains about a big shiny box, encourage them to provide landscaping and the aesthetics will no longer be an issue. Where is the enclosure in this picture? You guessed it. Behind the thoughtful landscaping. Plus, the engineer took the brief amount of time required to locate the device and enclosure on the side of the building rather than at the front. 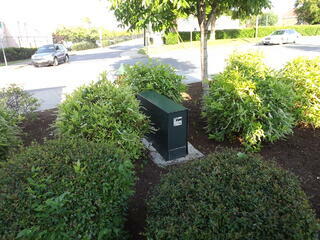 This enclosure is expertly hidden in landscaping of the proper size. The designer also thought to use color to make the enclosure more attractive. 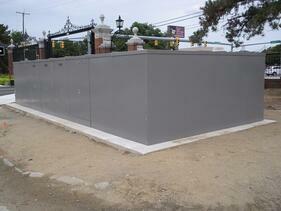 Hartford Green is probably our most popular color and can be applied to the enclosure free of charge. You might be asking the question, “what am I looking at in this picture?” This is a commercial strip center with several tenants. Behind this landscaping is four enclosures. How many can be seen? None, that’s right. Plus the landscaping does not block the line of sight for drivers entering and exiting the parking lot. Hats off to the design team on this project. You too can use landscaping to disguise an enclosure on your next project. You can also watch this short video to see more examples of enclosures blending nicely into landscaping. 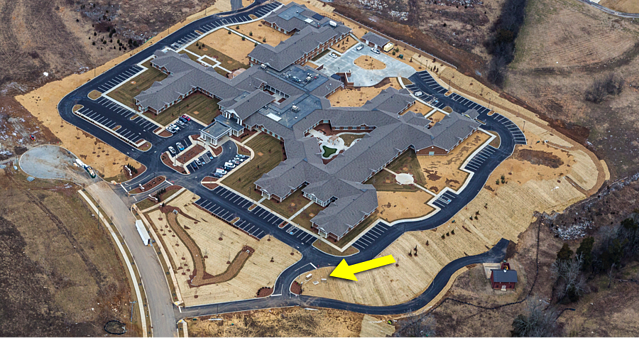 Historically, most civil plans review personnel, and civil engineers place the water tap for new service as close as possible to the property’s planned driveway location. But now, with an above ground backflow preventer enclosure to install, it’s much more sensible to think about the aesthetics and strategically place the water tap accordingly. Several jurisdictions have been using aboveground enclosures long enough that the plans review folks are already thinking about the enclosure’s impact at the beginning. Seek to place the backflow assembly as close to the property line as you can, but consider what will be in public view. The property line doesn't exist solely at the front entrance or along a roadway. How often do you see the electrical transformer at the main entrance of the building? Or in the middle of the lawn between the building and the road? 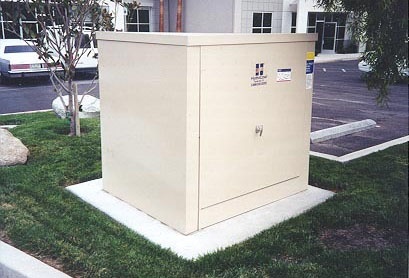 Sometimes, yes, but more often than not the location of the transformer has been thought about and placed where it is not so easy to notice. Why? Because it is not aesthetically pleasing. Think about the trash dumpster and where those are typically located. It's usually in the back of the building with some type of disguise that keeps them from sticking out and taking away from the appeal of the building. Backflow preventers can be installed behind or beside buildings out of sight, but stay in line with AWWA recommended best practices. Below is an example of excellent placement. Let's use the same thinking with backflow enclosures as we already do with tranformers and dumpsters. When we see the enclosure placed in plain sight, often at the main entrance, its no wonder the architect and building owner don’t like it. We’ve seen projects where the location of the enclosure was thought about. 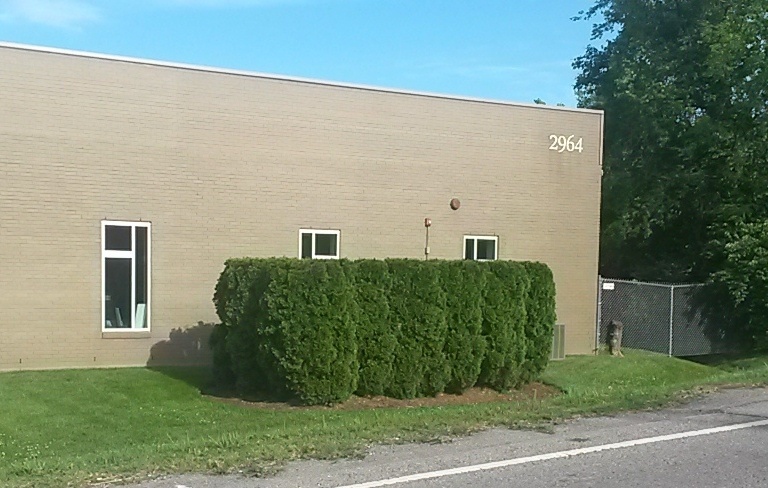 Those locations are usually away from the main entrance and often along the property line of the building. Watch the video below to see an example of a well placed enclosure. Until a few years ago, most backflow preventers 3" and larger were large and long. First there was a vertical riser through the concrete slab, turned 90° and then a series of gates and valves, all oriented horizontally in succession, then another 90° back down through the concrete slab. The new “n-type” backflow preventer solutions turn the shutoff valves into the vertical plane and place the 90° turns within the boundaries of the shutoff valves rather than beyond them. The result is a much more compact assembly. With a smaller assembly, you get a much smaller backflow enclosure. In fact, the covers for these new designs are as much as 70% smaller than their predecessors. If your client has a choice, there is little doubt which version will be preferred. Here are the two options sie by side. Both of these examples achieve the exact same goal. They are both RPZ backflow preventers protecting the water supply. The package for each - backflow device + enclosure - is about the same price. It's just that one of them is more than 50% smaller. By simply specifying an N-type backflow preventer with an enclosure, you'll please the architect and building owner on your project. These significantly smaller boxes will not only be less of an eyesore from the beginning, but they'll be easier to hide from view with color, landscaping, and a well thought out location.